This range physically spans 8-1/2 feet. I am unable to simultaneously reach end to end of the entire five-octave range, but can manage a span of about four octaves. I almost always hold four mallets, out of personal preference. This doesn't mean, of course, that all writing need be chordal; I would execute single-note lines alternating between one mallet in each hand or sometimes break up the lines between all four mallets. Since the bars (marimba keys) vary in width--wide in the bass range, becoming narrower by gradations into the upper range--I can span a larger interval between the two mallets in one hand in the upper range than in the lower range. In the lowest range, I can reach an octave between the two mallets of one (probably the left) hand. About an octave above that, I can reach a 9th or 10th. This increases gradually until, in the highest range of the instrument, I can reach as much as an octave plus a 4th between the two mallets of one (probably the right) hand. Within reason, it is possible for one hand to change between quite wide and quite narrow intervals (i.e. open and close, repeatedly) rather quickly. A wide variety of mallets (about a dozen gradations) are available between very hard mallets which, in the high range, would produce a xylophone-y quality--to very soft mallets which bring out the richness of the bass notes. (Hard mallets in the lower range produce a very brittle quality and can harm the instrument if played with loudly. Soft mallets don't "speak" at all in the upper range.) If you have in mind a certain type of mallet to achieve a special effect or timbre, it's best to simply write out what you're after, with a foot-note if necessary. A roll (tremolo)--to give the impression of sustain--can be executed by the two mallets of one hand or the other while the other hand is doing something else. This can be a roll on one note or between two notes encompassing any reachable interval. However, this is difficult to do much beyond the dynamic mf. It is sometimes difficult to play one-handed rolls for any length of time. Interspersing rolls between the two hands (i.e., alternating strokes) can alleviate the muscle fatigue of continuous one-handed rolls. For rolls between two, three or four notes, Ex. B is the much preferred notation to Ex. 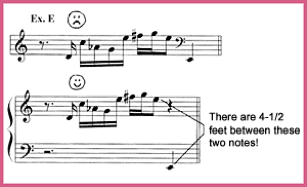 C. In the latter example, one doesn't see clearly which notes occur all at once. Should you have a specific preference which note or notes should begin the tremolo or be emphasized within it, you might devise something like the suggestions in Ex. D (there is no standard notation as yet for this--that I know of). You might overrule this suggestion if two systems take up so much space as to make page turns awkward, or if the music stays in one clef or the other for very long stretches. In composing for the lowest range of a five-octave marimba, you might want to bear in mind that, from the lowest G down to the bottom note, C, the major 10th harmonic partial is very strong. This is a basic acoustical phenomenon of low marimba notes. Therefore, for example, low E and the G below middle C played together actually sound rather dissonant. 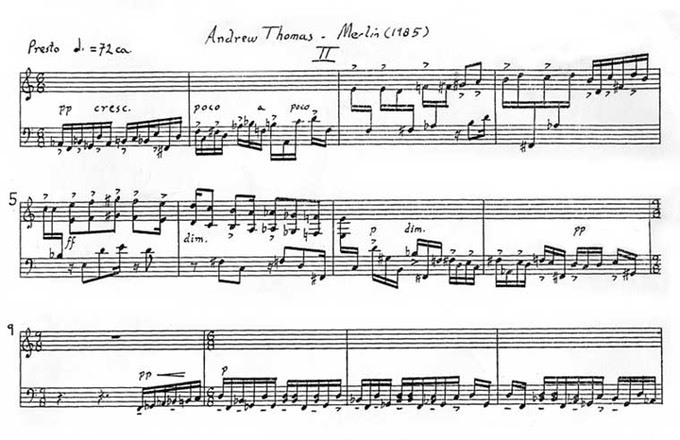 Finally, I add an excerpt from Andrew Thomas' wonderful marimba solo, "Merlin," which is excellently notated.